This is the campaign log for the Eighteenth session of a google+run Wandering Heroes of Ogre Gate campaign. The previous session is described HERE. Note that this session the party was split geographically by considerable distance, so the session log notes this with headers to make things easier. A map of the setting is provided to the right and can be enhanced by clicking on it. Bone Breaker continued his path to Hai'an but stopped at small mountain peak to find Master Ta's villa. At the villa he saw soldiers and martial heroes roaming the grounds. They found a woman named Little Frog who brought them to meet Master Ta in the courtyard. The Master was playing Go as Bone Breaker asked him to join his cause to unite the sects. Master Ta asked what he would get in return and Bone Breaker said indicated he could provide whatever he needed most. Ta pointed his finger to a neighboring peak and said he wanted Master Shan dead. He explained that Shan had stolen his family lands, including valuable mines. Bone Breaker negotiated this down to removing Master Shan from the region and Master Ta agreed. Going to Master Shan, Bone Breaker and his retinue made a similar offer to him. Shan told Bone Breaker he had heard rumors of his cruelty and was greatly impressed, but he'd also gathered news that Bone Breaker was changing his ways. Bone Breaker indicated that the change was a matter of necessity and not a reflection of a changed nature. At first Master Shan said he would only join Bone Breaker's cause if he could help him destroy Master Ta. But Bone Breaker insisted that he needed Master Ta alive and compliant. Master Shan eventually agreed to join Bone Breaker and even leave the lands he stole from Master Ta, if Bone Breaker secured him better lands in Hai'an. To make sure things went smoothly, Master Shan personally joined Bone Breaker for the Journey to Hai'an. They left, but Bone Breaker spoke one last time to Master Ta and secured Little Frog to go with him as a representative. While they were at Ta's, Master Shan went to Zun City and prepared his ship. Chen had gone back to the Ogre Gate Inn after meeting with Liling, one of the three sisters living in the caves of Bone Kingdom. Each sister controlled one of three phoenix talismans, objects imbued with destructive powers. Liling agreed to help Chen destroy Qinwen if he stole her sisters' talismans and gave them to her. The moment Chen saw Liling, he fell instantly in love. Chen gathered San, Sand Demon, The Venom of Zhaoze, One-Armed Fiery Demon and Fearless Cat then returned with them to Bone Kingdom. They decided to try the middle cave entrance. This led them to a chamber with a wall of cages filled with Owl Monkeys (creatures that resemble a blend of owls and monkeys with human faces and a bony point on their head. As they entered they saw a shriveled old woman feeding creatures in one of the cages. This was Dawa, the middle sister. She turned and faced the Party, demanding they leave at once. Chen refused to leave and tried negotiating over the Talisman with her. She refused and the two exchanged heated words. Finally Dawa stepped forward and gently brushed Chen and Venom of Zhaoze with her hand as five of her Owl Monkeys flew from their cages and attacked. She whirled around and informed Chen that he was dying, demanding he listen to her if he wanted to live. Soon a crushing force moved through his body. Chen shook his head and told San to attack her as he dropped into meditation to fend off the effects of her touch. San used Kick of the Swan to kill the Flying Monkeys, leaping from one to the next, delivering a lethal kick with each step. Fearless Cat uses the all Encompassing Emerald to imprison Dawa. As Fearless Cat held Dawa, Chen and Venom continued their meditation until her touch no longer had any effect. The Venom was fine, but Chen nearly died (note: he was one failed Meditation roll away from dying). Eventually San and Sand Demon killed the Demon Monkeys and the Emerald crushed Dawa, not killing her, but leaving her on the brink of consciousness. San commanded Sand Demon to kill the remaining Owl Monkeys. Bone Breaker went with his retinue on Master Shan's ship to Hai'an. They disembarked at Huising and headed North to the capital, Xuanlu, through the Skinless Forest. At the grand palace they spoke with an official and asked for an audience with the King. They were told the soonest they could have an audience was in four months. This was unacceptable to Bone Breaker who threatened to torture the official if he didn't make better arrangements. The official refused but when Bone Breaker used his reputation to threaten the man's family, the official paused and suggested an audience with the Queen instead. They spoke with Queen Ai Nu through a partition and she expressed interest in Bone Breaker's services. Bone Breaker said he needed the land around Whispering Lake. The Queen seemed reluctant and said it would take considerable support from him for her to arrange such a thing. They danced around the subject for a while before the Queen said she would be willing to grant the land to him if he could help her son conquer Hu Qin (General Dee's territory). Bone Breaker agreed and Queen Ai Nu said he would have to convince her son first. She gave him a seal and told him to travel south to Harmony Sustaining Palace where the king could be found. With Chen so heavily injured, the party sent Sand Demon to scout the rest of the cave. They found Dawa's room and the talisman of Li Huang. San went with Sand Demon, taking a bronze mirror and jade comb from her room. Then they returned to Ogre Gate with Dawa and the Talisman. At the inn they brought Dawa into The Venom of Zhaoze's quarters (where the State of the Emerald Monk had been concealed behind a partition. Then they gathered the House of Paper Shadows musicians. There they awakened Dawa and forced her to promise not to harm anyone at the inn, to which she agreed. Then they made the musicians make a similar promise (which they also made). Because the state was present, there would be consequences if either tried to violate their promise. Chen and San spoke with Dawa. At first she was hostile but she became interested in them once she realized the Chen was in love with her Sister, Liling. Even though they stole her Talisman, she offered to help them take the second one from Binying (her eldest sister). However she wanted things from them in exchange as well. In particular she wanted their aid in securing Qinwen's Talismans. Chen asked Dawa if she liked human meat in her duck. She expressed enthusiasm for such a dish and went to the dining area for two orders of Longevity Duck. They planned to go back to Bone Kingdom, but before they left Chen received word from their information network that the King of Li Fan was planning to march against them with 75,000 soldiers in fifteen days. They already knew the attack was coming but didn't know when. This placed added pressure on them to move quickly with the Talismans. Bone Breaker went to Harmony Sustaining Palace, a retreat on a large lake. There he found the king enjoying music and dancing. His reception area was informal but he seemed to have low regard for Bone Breaker due to his social class (Bone Breaker is a merchant). However when presented with his mother's seal, he began to listen. Bone Breaker was impatient to invade Hu Qin and said he could deal with General Dee and give aid to his army. The king expressed reluctance, saying he had too many things to do and would be unable to invade for at least a month. Bone Breaker spoke with him some more, learning that the king was more interested in music than governance. He suggested that the King allow him and his heroes to lead the attack. At this point it should be noted that Bone Breaker was traveling with a retinue of highly regarded heroes and had plenty more back at his inn. The King agreed and warmed up considerably to Bone Breaker when he made the suggestion. The attack could be mobilized in ten days. The king would work on a way to get his generals to follow Bone Breaker. On the way to Bone Kingdom Dawa warmed up a bit to Chen and called him Lover Boy. She then informed him that if he wanted to marry Liling, this could be arranged and she would help. But he would have to be truthful to her and not go back on his word. She also insisted that he treat her as a Sister. On the way to Bone Kingdom she informed them that Liling was the youngest sister and the most beautiful. Dawa and Binying had aged in the last several hundred years but Liling was strangely resilient to time. While both her sisters were wicked in her estimation, Binying was by far the cruelest. Liling was the most deceitful but not as quick to kill. When asked what that made her, Dawa said "I am the most compassionate sister. My compassion is boundless." Dawa also suggested that the mesa at Bone Kingdom would make a more strategic location for their stand against the king. 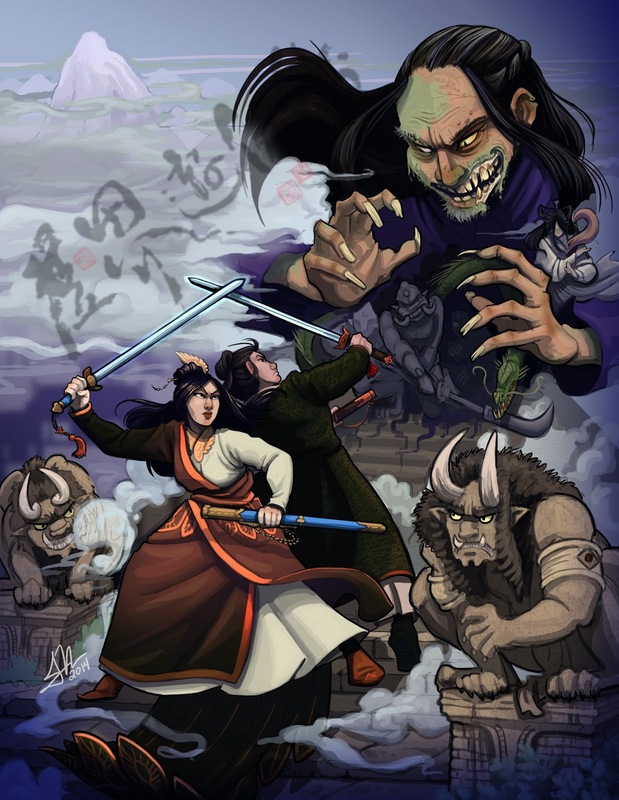 When they reached the caves of Bone Kingdom, Dawa led San and Sand Demon into Binying's cave. She suggested an attack while her sister slept, since she tended to sleep deeply for some reason. She also warned that their were many dangerous servants they should avoid, particularly a man named Chef Guo. They found Binying sleeping and attacked her using stealth Kung Fu. San delivered a deadly strike with Kick of the Golden Elephant, while Dawa used her Gentle Touch, and Sand Demon impaled her throat with his stinger. This was enough to quickly do her in. She wore the Talisman on her neck and both San and Dawa tried to grab it. Dawa was faster. Once she had it, Dawa dangled it before San and made her promise not to go against her word. When she agreed, Dawa handed it to her. Searching the room, they found that the bed was made of a blue milky stone that resembled jade but was cold and swirling with golden energy.